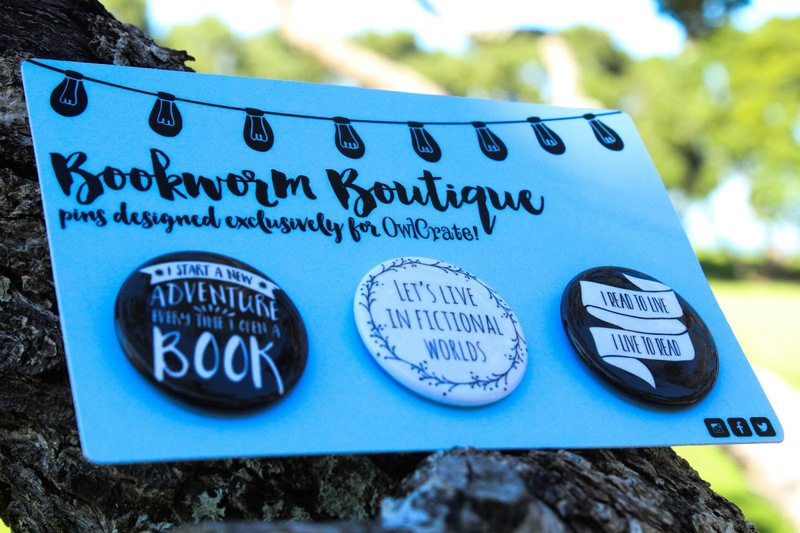 Bookworm Boutique: OwlCrate March Review + My Participation! OwlCrate March Review + My Participation! Yay! 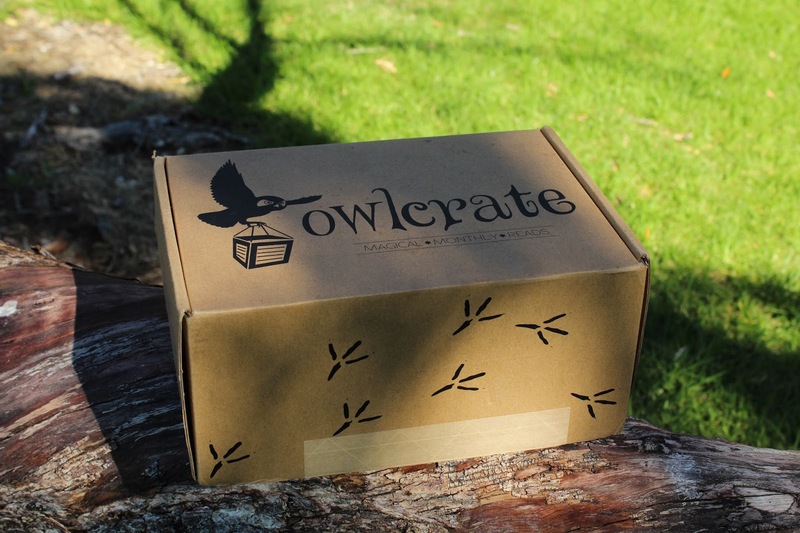 It's time to talk about OwlCrate and how freaking fab it is and how freaking fab it always is! I know, I know... I'm a representative for this company, so how can I be objective? Well, OwlCrate has always been awesome, there, now you've got proof. Anyway, the March 'Writer's Block' box was OwlCrate's one year anniversary and I was a part of it!!!! You'll have to wait to see how, although if you've been on Bookstagram lately you may have already seen my part in last month's box. Congratulations to a great business for a fabulous year of boxes! If you don't already know, and I'm assuming that a lot of you do, OwlCrate is a monthly YA subscription service. Each month they send out a box (like the one pictured above) and inside is one Young Adult hardcover book, 2-4 bookish goodies, and usually some bookish swag! But what is bookish swag?? It's usually letters from the author, or signed bookplates, or cute little bookmarks that have the title of the chosen book on it, very cool! 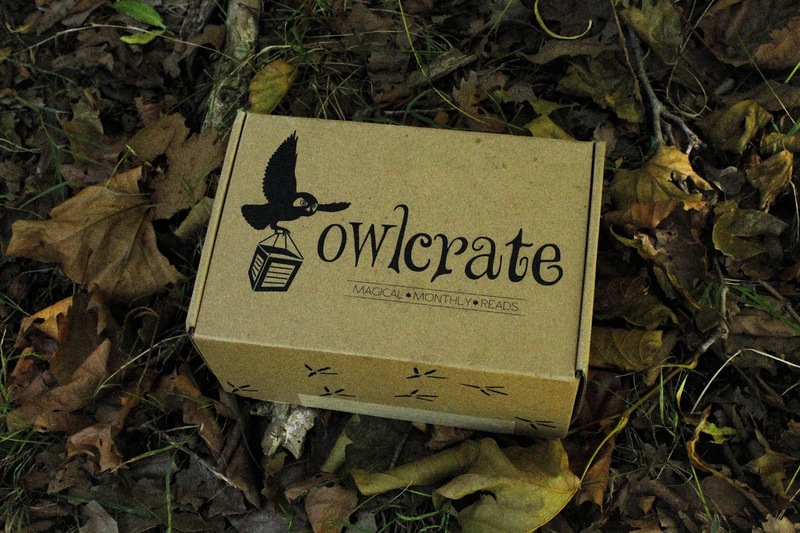 OwlCrate is $29.99 per month + shipping and is freaking fantastic... wait, did I already say that? Now I'm going to show you what's inside the very awesome March OwlCrate! 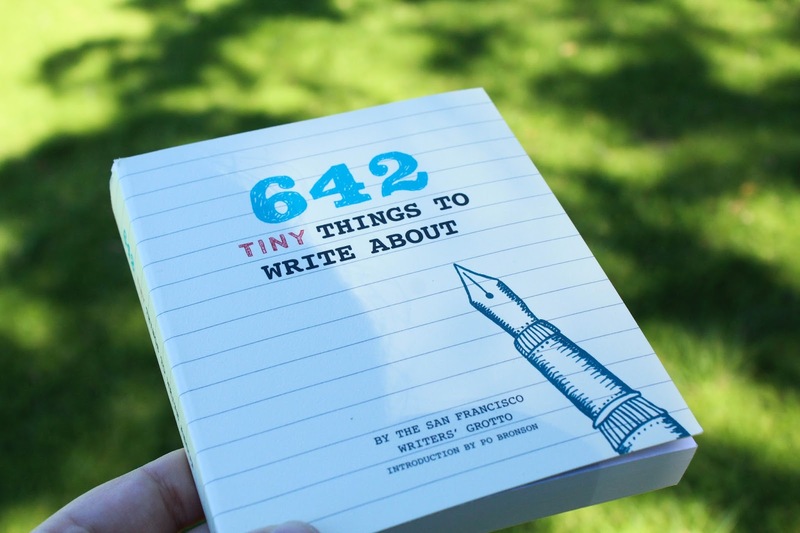 The first item I'm going to talk about is this super neat little "642 Tiny Things to Write About" book which is insanely adorable. I received a copy of "642 Things to Write About" many Christmases ago from a wonderful friend of mine, and while I didn't write in the actual book (I just couldn't bring myself to do it!!) I did copy the prompts onto a Word document and use the book like that. The book is from Chronicle Books and OwlCrate promises that it'll "Get your creative juices flowing and battle writer's block" which I'm very sure it will! The prompts are designed to help inspire short stories, so if you received this book and have written something thanks to a prompt in this book I'd love to hear it! Make sure to leave it in the comments below and I might just write one too. 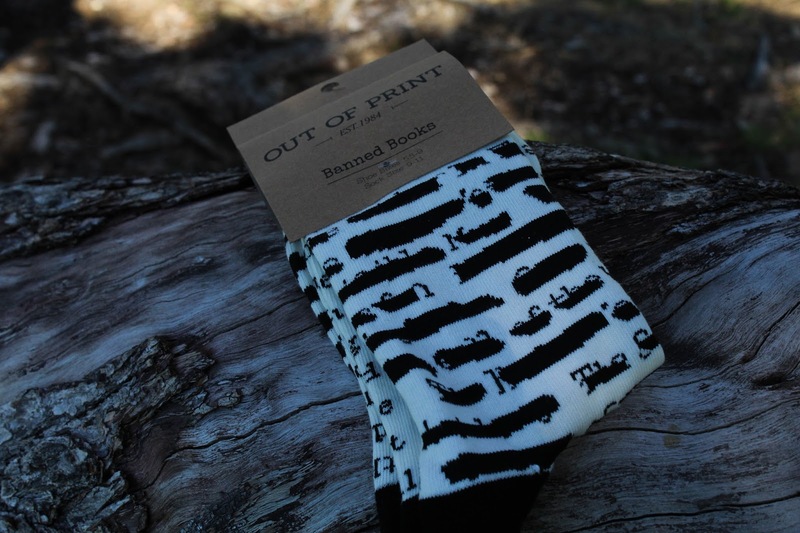 This pair of socks from Out of Print were also included in the box and it was sure to have gotten the whole Bookstagram community thinking one thing and one thing only... SOCK SUNDAY! These socks are so cute, one sock has the names of banned books and the other has the same names but they're blacked out. The socks are super soft and are really good quality (as you'd expect from such a popular company!) -- I think we all received the same size (Shoe size 5.5-9, Sock size 9-11) which are probably perfect right across the board, I haven't heard any complaints! Now, this item is so so so so cool, but I cannot tell you how badly I wanted the other version. I know, I know, it's ridiculous! I'm like a kid in a candy store who wanted the pink lollipop instead of the red one even though they're the same flavor and ended up disappointed. 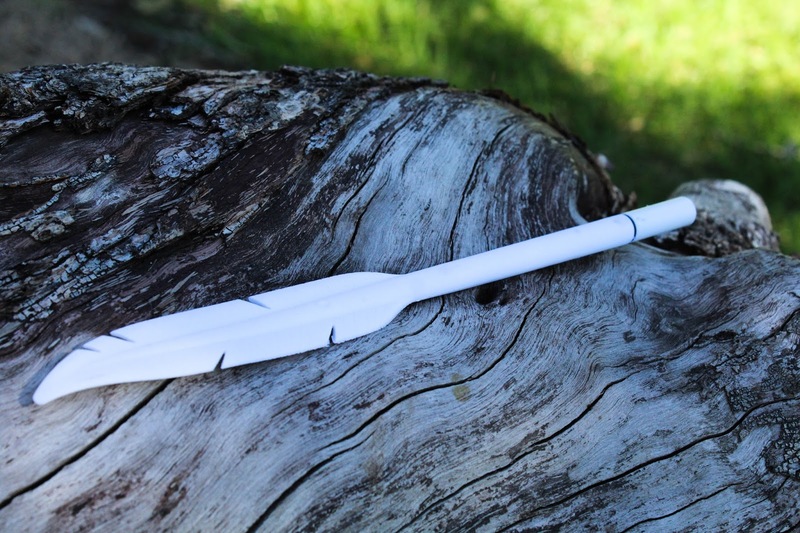 Guys, I quickly got over the fact that I originally wanted the black 'quill' pen because it's awesome. Like, for those of use who *secretly* attended Hogwarts School of Witchcraft and Wizardry it helps to blend in with muggles while still being in touch with our wizarding heritage... ahhhhhhh. The pen is from Kikkerland and was sent out in both black and white. On the OwlCrate card (which I forgot to photograph again guys, and I'm seriously kicking myself about it!!!) it says 'quilliant' and it's said by a little dog doodle and that made my year and it was MArch. Last but not least (because it's my item... oh my god, I'm so kidding and half of me wants to take that out cause it's so pretentious sounding but I think I'm hilarious so they other half wants to leave it in... I'm gonna leave it in...) are the pins from 'my store' - TA - DA! OwlCrate contacted me a few months back and asked me if I'd like to be a part of the April box and let me know roughly what the theme was focused around but didn't tell me exactly what it might be and of course I said yes! We collaborated on this item because I don't actually offer pins in my store, so while I provided the background and pin art, the wonderful OwlCrate team sussed the rest! 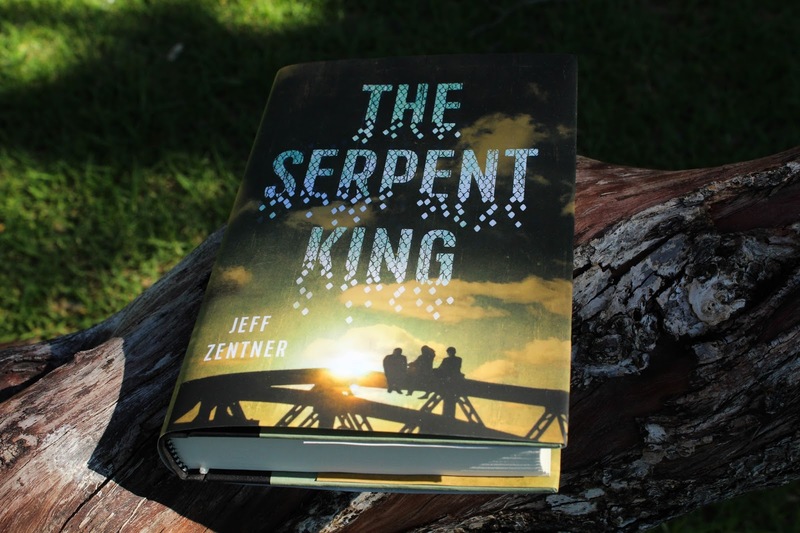 "Dill has had to wrestle with vipers his whole life—at home, as the only son of a Pentecostal minister who urges him to handle poisonous rattlesnakes, and at school, where he faces down bullies who target him for his father’s extreme faith and very public fall from grace. Their diverging paths could mean the end of their friendship. But not before Dill confronts his dark legacy to attempt to find a way into the light of a future worth living." 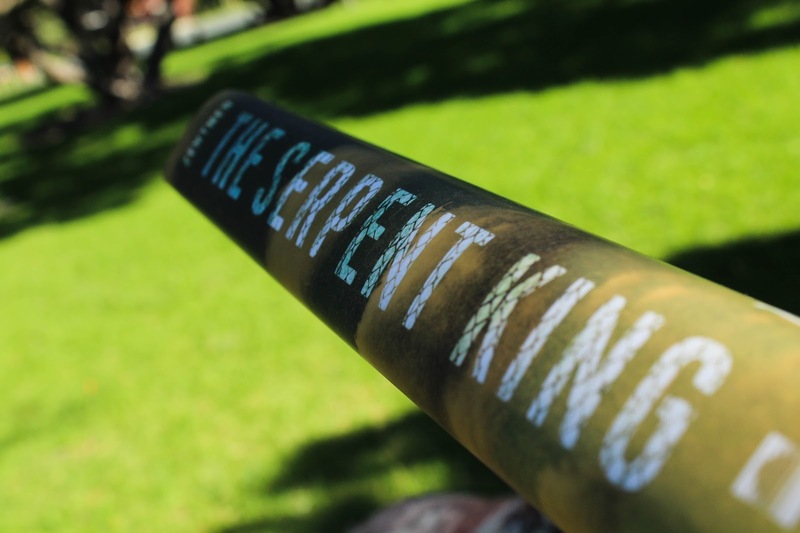 From those who have received The Serpent King in one of a few subscription boxes that sent it out I've only heard amazing things, so I was more than happy to pop it on my TBR! Very excited to read this book! 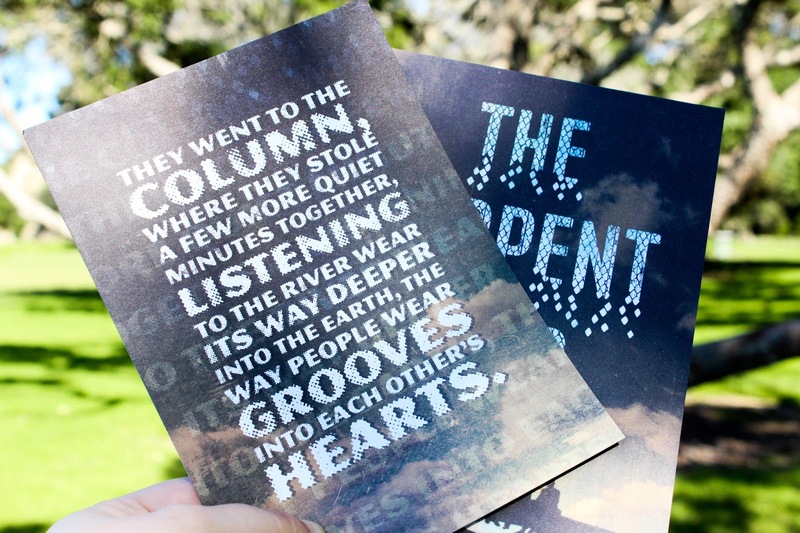 Also included were these two pieces of bookish swag. The card in the back of the image is a letter from the author Jeff Zentner which is really lovely and is now on my wall of bookish things. The card on top is a quote and on the back of that card is information about a competition where the grand prize is a free OwlCrate which is really awesome! I really loved the Writer's Block theme, I think it's lovely to acknowledge those who are aspiring writers, I know there are a lot of you out there, in subscription boxes. Personally, I think all the items are extremely usable and are amazing quality. I will use that amazing quill pen until there is no ink left in the world... and on a totally unrelated note, where can I refill pens instead of leaving them in a jar empty of ink??? Thank you OwlCrate for yet another beautiful box! *Coupon code below! April's theme is DYSTOPIA! Oh my goodness, oh my goodness, oh my goodness I'm so so so so so so so so excited!! My favourite genre ever is Dystopian!!! OwlCrate has teased that they're working with some freaking amazing stores and it's going to be epic! I'm thinking The Hunger Games and Divergent and maybe some other awesome stuff, I'm so excited ahhh! If you’re interested in signing up for OwlCrate or giving a box to a friend as a gift, you can use the code BB2016 at checkout to receive 10% off the price of the box. April's theme is “Dystopia”, OwlCrate writes “[April's] box will contain an addictive and unique dystopian novel, as well as lots of items inspired by our favourite dystopian stories. If you like The Hunger Games, The Maze Runner and Shatter Me you won't want to miss this box!” so make sure to head over to their website and sign up! Here are the links to all of OwlCrate's social media, make sure to follow them because they're always sharing giveaways, sneak peaks, running competitions and all kinds of neat stuff!